I played yesterday trying to make bubble backgrounds but because I was using matte cardstock it was really subtle. So this morning I woke up and I had found some semi-gloss blank cards while cleaning. I decided to experiment with that. While I was at it I decided to try photo paper since I have so much of it and my roommate gave me several packages of 8 x 10. Both semi-gloss card stock and photo paper work great. Here are the two cards I made in between cleaning out a closet to stack packed boxes in. This card I did the bubble technique using photo paper. After the photo paper was dried I took a stencil and gold paint and stenciled my design. While that was drying I sprayed the cardstock for my focal point. 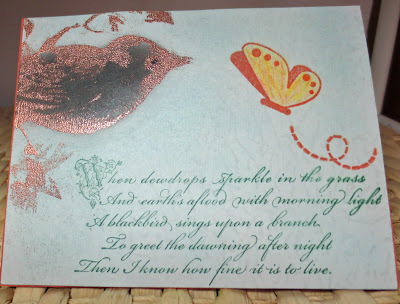 After that dried I stamped with embossing ink and used Perfect Pearls. I actually used two different colors but it is hard to tell. The stamp is by Fancy Pants. I love how the bubbles turned the semi-gloss card front into this elegant background. For some reason although it didn't do so on the photo paper on the semi-gloss cardstock the bubble mixture actually dried textured. I definitely need to find some semi-gloss cardstock. I decided that I needed to do something simple. So I took a Fancy Pants stamp that I think is meant for large scrapbook pages as it is so large and stamped with embossing ink. Then brushed Perfect Pearls over it. I'm thinking using blue paint to color the bubbles this would be neat for a water theme card or layout. It is so easy to do and youngsters would have fun doing this over Summer break. Add liquid dishwashing detergent and water in a shallow container. (A pie pan will work) Then add a little bit of paint. I used acrylic but tempra paint would probably work. Blow bubbles with a straw until they are almost overflowing the container. Then gently pat your paper over the bubbles. The bubbles will stick to the paper where they will eventually pop. I did it several times moving my paper until I got something I liked. I tried this with commercial bubble mixture and I couldn't get it to foam enough. I did blow bubbles with the wand using the commercial mixture I had colored with food coloring and letting them land on the cardstock. I got an interesting background. Since I was using matte cardstock I got some interesting splotches also. Thanks for stopping by and looking. Do come back. Wishing you Happy Frugal Crafting till we meet again! The Paint Swatch technique is so fast that I decided to see how it would work with my Distress ink. Besides I don't have that many chalk inkpads with graduated colors in the same color family. I used Antique Linen, Tea Dye, and Vintage Photo distress ink for the background. Beauty is a stamp from a Fancy Pants stamp set and is stamped with Memento black ink. I thought I had gotten beauty stamped crooked but then I looked at the stamp and it is made that way. My trusty Cameo cut out the butterfly pieces. I brushed Heirloom Gold Perfect Pearls over the printed butterfly. Thank you for stopping by and do come back. I hope to put together a card using an interesting background which involves play. It was super fun to make and allowed me to take advantage of the sun as it is best to do this outside. This was such a fun technique to try and I'll be doing it more often. I would have done it sooner but I had to go to the hardware store for the secret component needed to make the background. My breeze ink was too light so I had to go back over where I used it with my Sky Blue Brilliance ink. My yellow dye ink also did not show up so I ended up going over where I used that with Gold Brilliance ink. The bottom band of color is Seafoam chalk ink. I bought Tuesday the cute sailboat stamp for $1. It is by Studio 112. I am pleased at how nicely it stamped. 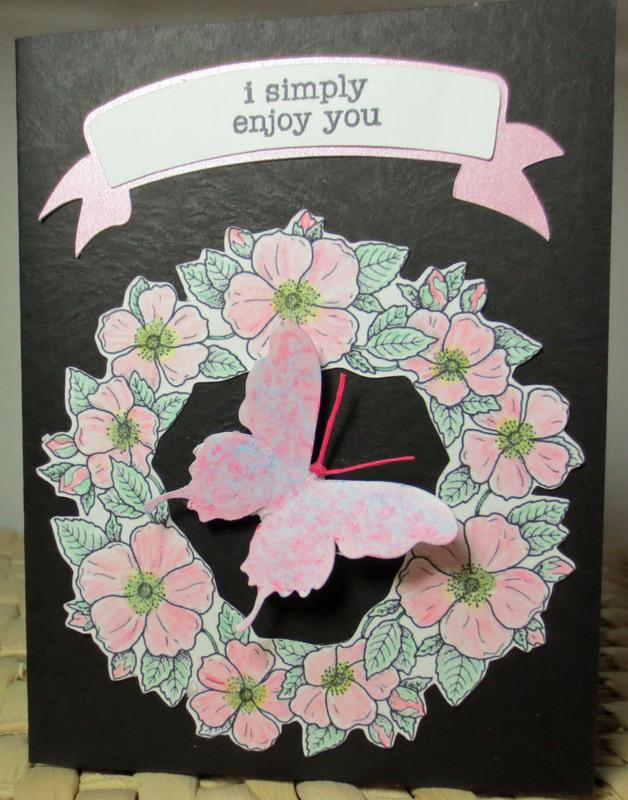 The sentiment is from the Inkadinkado Inspiration Lift stamp set. This was a quick and fun card to do. Cameron my Cameo did get to cut out the panel I used to make my background and stamp on. Hope you are enjoying beautiful Spring weather. It is gorgeous so I've been going for long walks instead of spending a lot of time crafting. I used blue metallic paint for the houndstooth background. I love how it turned out. I thought of dusting the back of the dimensional sticker with powder so it wouldn't be sticky and then adding foam to pop it up off the background but then decided to just lay it down flat. I was going to heat emboss on the ribbon but the embossing powder was in places I didn't want it to be. I think it is the brand of embossing powder as I've had that problem in the past. with it clinging to places I don't want it. 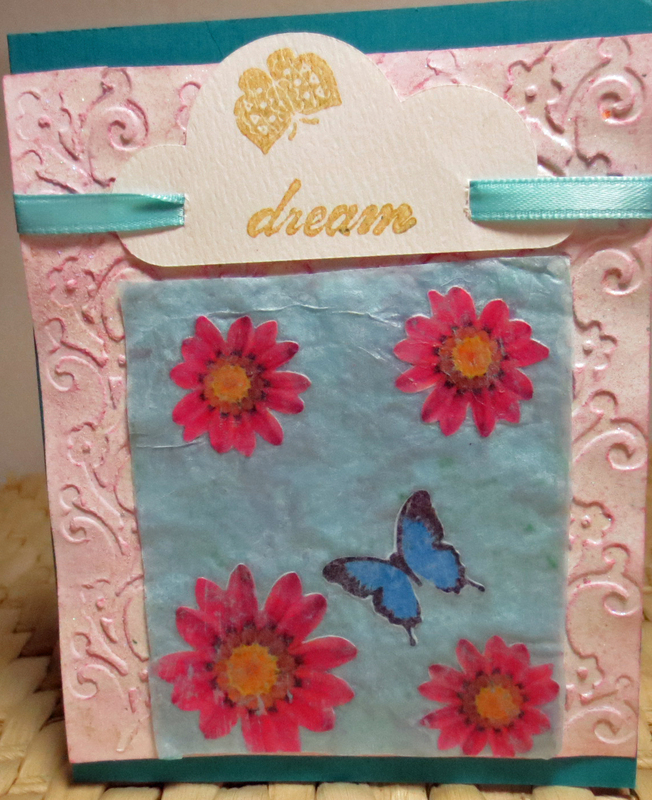 I then decided since I liked the ribbon to stamp on cardstock to layer on top. I chose the Seafoam chalk ink because the color matches the gem. There you have it my quick and fun card. I was surprised at how fast the metallic paint dries. I am looking forward to having more fun with it. Some people cook when they are stressed or eat. For me when I'm stressed I create or clean. In this case I've been doing both. I decided to experiment with oil pastels, regular colored pencils and cooking oil since I don't have any mineral oil. After a couple of days of experimenting this is the card I came up with. Downloading Dover samples for the week there was this image. I already had it on my computer and remembered that I wanted to do something with it. I turned it into a print and cut. I first printed it on gray cardstock. After coloring it with regular colored pencils and oil pastels I took a cotton swab dipped in olive oil and rubbed it over the image. Alas the black ink smeared giving it a really gray cast.It was aweful but I didn't feel bad as it was relaxing doing the coloring and I need the practice. I then went and reprinted on white cardstock. I meant to color with my regular color pencils but picked up the watercolor ones instead by accident. I wasn't pleased with the pink so went back over the flowers with my regular colored pink pencil. I did use my aqua brush on the center of the flowers as I didn't mind the black bleeding a little bit there. For the butterfly I first tried vellum and oil pastels. The cooking oil remained on top and didn't look like it was going to dry. 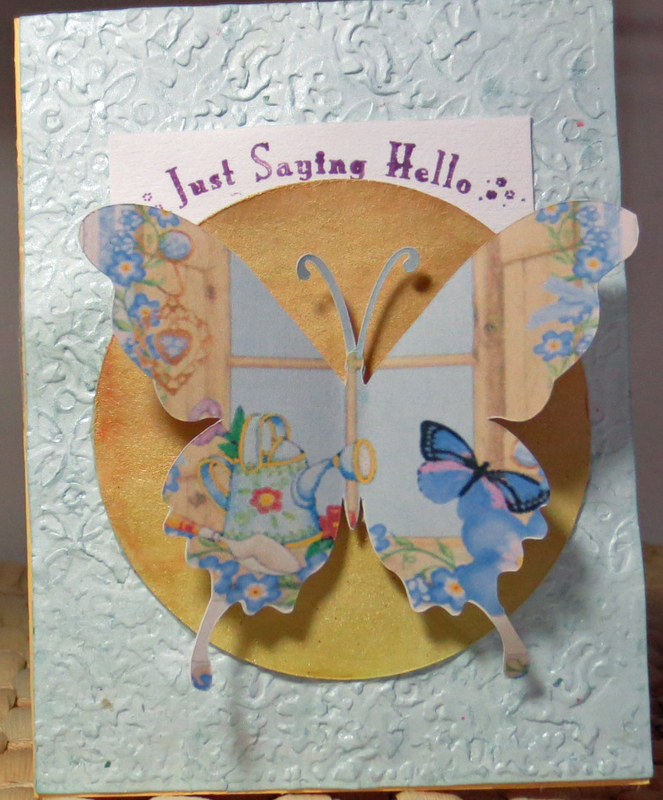 I found a scrap of white cardstock and cut out another butterfly. I doodled with blue and pink oil pastels. Then took my cotton swab dipped in olive oil and rubbed it over the butterfly. I love how it turned out. For some reason the antennas always seem to tear when my Cameo cuts them. I double knotted a piece of scrapper floss in the middle and glued the bottom knot to the back of the butterfly. I often agonize on how to do a sentiment and have it look like it wasn't just thrown on as an afterthought. When I saw the banner in the library I knew it would be perfect. I cut the bottom layer of the banner out of glimmer cardstock. The top was cut out of a scrap of white and then I stamped my sentiment. What do you do when you are feeling stressed? This was a fun card to make. While sorting through things I found a bunch of squares cut from heavy cardstock. They were left over from a demonstration I did several times where I sprayed air freshener on the cardstock so customers could sniff it and write down on the square of cardstock what the scent was that they liked. I figured since the squares were so heavy to see how they might react to watercolor pencils and water. They look and act like they were cut from heavy hot pressed watercolor paper. Here is my card. I took purple, vermillion, and blue watercolor pencils and scribbled on the square. Then I took a wet brush and brushed over my scribbles. After the square had dried I stamped with my music background stamp. For the butterfly I went in studio and made two copies of it. The first butterfly I filled in with a pattern and made the pattern more transparent. The second butterfly I filled in with another pattern. Then I merged the two butterflies into one. I made a copy then of the new butterfly. So I could print and cut two butterflies out. After Cameron cut out the butterflies I brushed metallic lavender watercolor paint over them on the printed side as well as the back, I wish the metallic sheen would have shown up in the photo. The butterfly is absolutely gorgeous in person. When they dried I cut scrap floss for the antenna and sandwiched it between the two butterflies. The butterfly is attached with a tiny piece of 3d foam. I thought the cardbase needed something and when I saw the paint chip I knew it would be perfect. It really makes the colors on both the pencil background and the butterfly pop. I love how printed shapes look with a light brushing of the metallic watercolors over it. I will be doing this more often. I also will probably be playing with my watercolor pencils more. Now I want to buy watercolor crayons for a neat technique I saw done. 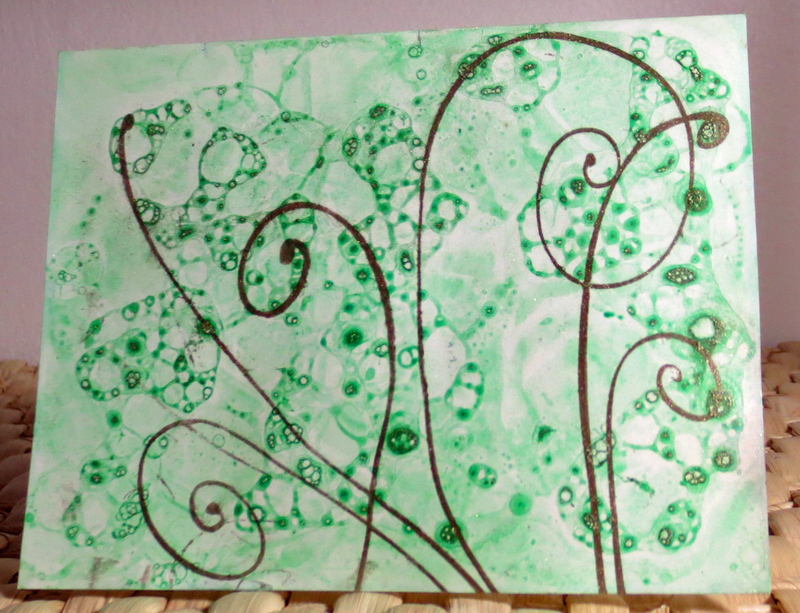 Using watercolors is an inexpensive way to make pattern paper. The advantage to it is you usually can match your homemade pattern paper to your other elements. Do you ever work hours on a crafting project only to end up tossing it in the garbage can. Well, sometimes I do. However, I try to salvage what I can off the card that might work on another card. 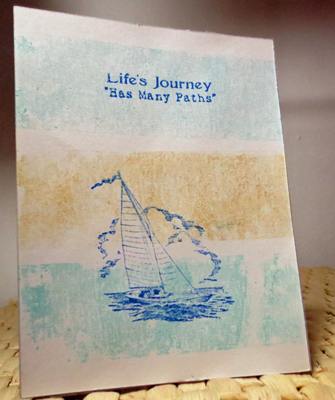 Yesterday I played with stenciling with gesso and stamping on burlap to make a card. I decided this morning that the card needed something so cut out a vellum butterfly. I was going to post the card on my blog here but absolutely hated how it turned out. 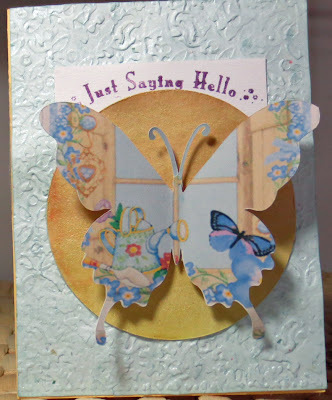 I salvaged my butterfly and with another piece of burlap made a new card this afternoon. 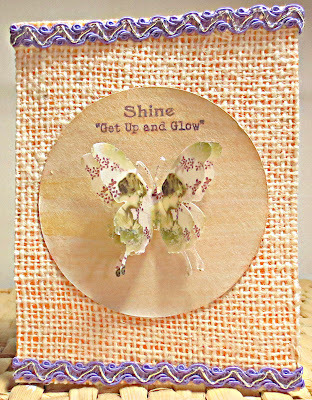 I think I like the contrast between the rough burlap and the delicate vellum butterfly image. I'm thinking that lace would be neat as a background also. I took and cut the card base apart that I was tossing and glued with Elmers burlap on the good panel. Cameron my Cameo cut out a bunch of circles for me. They are always handy to have on hand. Plus I figured if I messed up stamping I would have extras. 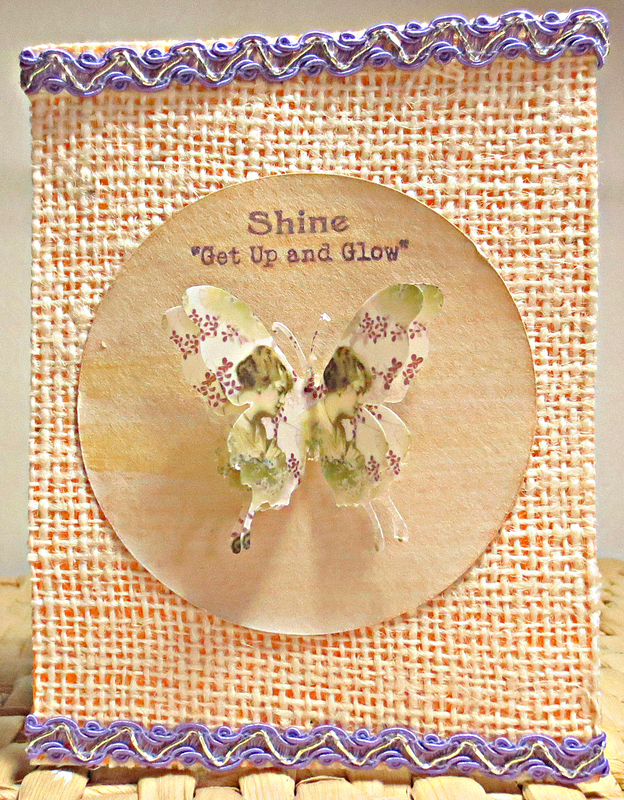 I stamped the sentiment from Inkadinkado Inspiration Lift set with Stazon Royal Purple Ink. So I could brush yellow and orange metallic watercolor paint on the circle. I filled in my butterfly shape in Studio with my vintage image. Then I realized that it was a transparent image so I was able add a background pattern without having to go into Photoshop. I pop dotted with a small strip of foam tape the butterfly. The photo doesn't do the butterfly justice. I decided to add rickrack at the top and bottom. Time for me to get back to sorting things. Luckily many of the boxes I'm sorting through are marked but there still are a lot of boxes labeled miscellaneous. It feels good to be downsizing as well as traveling down memory lane. I may not get much sorting done today as the box I'm working on now has a label which has written on it Baby book. Thank you for stopping by and do come back. I'm playing in the evening before bed with watercolor pencils so hope to have a background done soon. I find it relaxing to color and draw abstract designs. 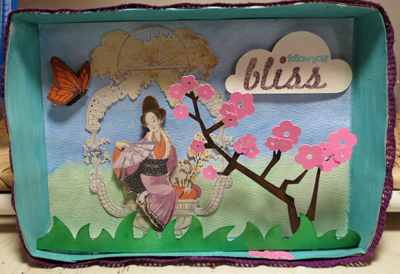 My dear friend Beth Norman has on her blog a beautiful card which inspired me to make this card. You can find her creation here. And here is my card. For the background I started out by using two different embossing folders on the panel but didn't like the results so went back over with the Tim Holtz embossing folder. Then I did not like the white card stock with the speckles in it so went and use my homemade glimmer mist. The circle was filled in my cutting software with a graduated color and here again I didn't like it so I brushed yellow metallic watercolor paint over it. The butterfly is a cutting file that came with the software, I filled it in with one of the images I have stored on my computer. I was trying to get the same feel on this card as Beth got on hers. Because my goal is to use at least one stamp on a card I decided to use just the sentiment part of a stamp. Alas my markers all appeared to be dry so ended up having to use one of the purple ones from my Memento purple marker set. I loved how this sentiment was curved on the rubber stamp. O.K. I'm back to sorting stuff. It is like a treasure hunt as I found semi-gloss blank cards,gems,and other kind of things including an unopened bottle of Dimensional Magic. I have a library book which is due in about three days so I've been trying to do some of the techniques in the book before that time. One of the techniques that caught my eye is the encased technique. I've done something similar to this with wax paper,kleenex,and PVA glue. When I've done this in past I've used dried flowers. This is the first time though using wrapping tissue paper and moulding gel. Also I've never done it with images printed with my inkjet printer. I didn't have a thick enough coat of moulding gel on the top layer of tissue paper so the flowers are a little splotchy where the wrapping paper is not as transparent looking.. I was pleased that the print images did not smear. The embossed panel was left over from play while taking my card class. I heat embossed on the deboss side and brushed watercolor over the entire panel. I decided to see about threading ribbon through my cloud sentiment. I think I like the effect although I needed to slit the one side a little longer. So there you have it my play for yesterday and today. I was going to do painting on fabric for a card but saw a card on my friend Beth's blog and will be making my version of that card and posting it. The sun is shining so I'm off to take the dogs to a dog park. Thanks for stopping by. Wishing you Frugal Happy Crafting till we meet again! I saw in a library book which I need to return a beautiful background for a card using wax paper to make a resist. 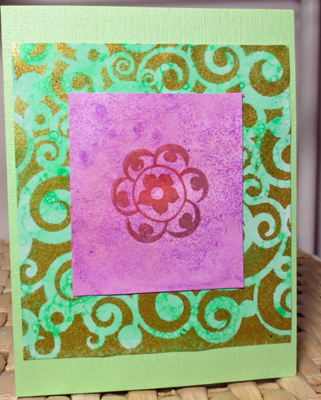 I wasn't sure if the wax resist would work with heat embossing so decided to experiment. Like usual there are a few things I would have done differently. I'm thinking the bird might have been better with silver embossing instead of the copper. I really need to get some black embossing powder if I'm going to use this image and sentiment together again. Also I wish I had put the butterfly up just a little higher. Yes,Beth I used that gray cardstock for this. LOL! To make the background I took a piece of wax paper and crumpled it up and then smoothed it out. I placed copy paper down on my work surface which is heat resistant and then placed my cardstock panel down. On top of that I placed the wax paper and another sheet of copy paper. Then I took my trusty iron set at the cotton setting with no steam. (The only time the iron sees action is for crafting. LOL!) I ironed over my paper sandwich until the pattern appeared on the top sheet of copy paper. Be sure and save the copy paper when you are done as you will have some beautiful pattern paper which you can leave as is or use chalks or ink over. By the way for those who have embossing machines you can emboss your wax paper and then do the same thing. In my play I discovered that you can stamp first and then do the wax paper resist. If you heat emboss you will want to do the wax paper and then your heat embossing. If you stamp after doing the wax paper resist you will need to use an ink like Stazon. Like I did here for the butterfly. After messing up four times stamping the sentiment I decided to stamp first. The sentiment and bird are from a jumbo stamp set. I did some masking of the bird and stamped just part of the bird. After heat embossing the bird I first used Memento ink to color the bird but didn't like it. So I then used chalk on the bird. I used a gel pen for the eye. I used colored pencils on the butterfly. After I was done with my chalking and coloring of images I then used chalk ink on the background. I wasn't pleased with it colorwise so went back and rubbed chalk over everything. I discovered while I was experimenting that a white eraser will erase dye ink if you get it where you don't want it. It will also erase chalk which I knew as well as the chalk ink. I made it a goal to play for at least fifteen minutes a day but didn't get around to it yesterday. I decided to make it thirty minutes today but was having so much fun experimenting that time got away from me. That is alright though because now I'm ready to do more sorting and deciding what things I want to sell or donate. I'm off to purge and sort but don't worry I'll be back with more projects. In the meantime thank you for stopping by. Wishing you Happy Frugal Crafting till we meet again! Wow! Was this shadowbox ever a lot of work. The great thing about having a Cameo and the software is now I have the files made up I can resize and use them for a card. I am going to use these files and this layout changing the sentiment on the cloud.. Sorry about the shadows but I just didn't seem to be able to get a picture without the shadows no matter what I did. To make my shadowbox I made a cutting file in Studio and cut it out twice. Then I glued the layers of heavy cardstock together. Alas it warped some when I painted inside. I think next time I'll cut a shadowbox out of thin cardboard. I painted the background with both my regular and metallic watercolors on cold pressed watercolor paper to add some texture. I really need more practice using watercolors. 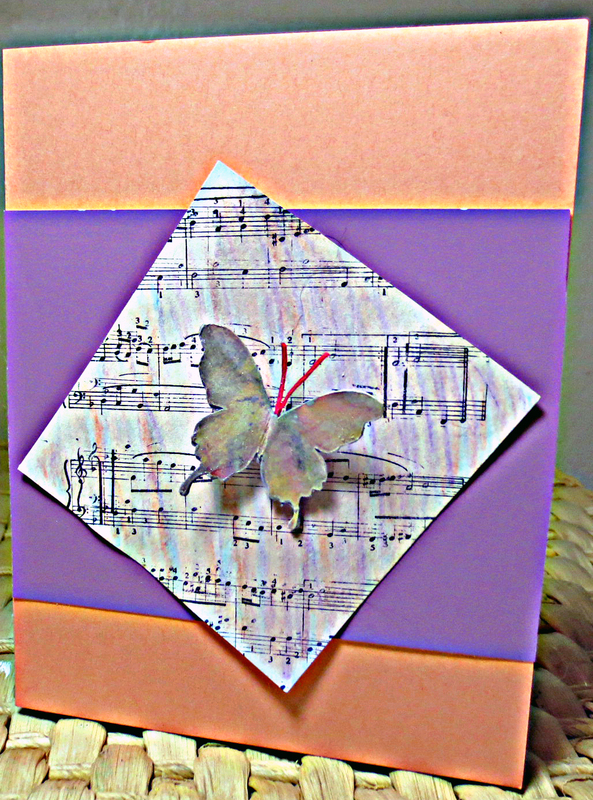 The butterfly is a print and cut which I used on my hydrangea layered card. I just resized. I used Mandarin Orange Perfect Pearls on the butterly. He really shimmers but alas you can't really see it in the photo. He is pop dotted as is one wing. The oriental woman sitting on the bench is an image from Dover publications. I fell in love with her when I first downloaded her but to be honest was intimated to turn her into a cut and print. The hardest part ended up turning her into a separate image so she could be pop dotted. I decided to use a cloud for my sentiment. It was cut from a scrap of hot pressed watercolor paper which is smoother. 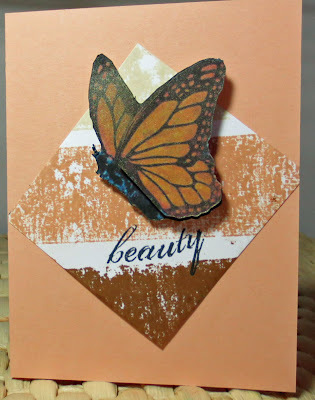 I had seen a tutorial on heat embossing with two different colors of embossing powder yesterday so decided to try it. Sorry I still don't know where I got this free cutting file for a cherry tree in bloom. I painted the tree and after it was dry glued my blossoms on it. I decided to glue it on the shadowbox itself as well as to the grass. The grass was a file I had made for another project. Just did some resizing. I didn't like the green I had filled the file in with so used my homemade glimmer color. I also wanted it to look like the grass has dew on it. I added a fold line and it is glued to the shadowbox. I painted the lace that is on the outside with acrylic ink. The outside of the box is also papered. I need to make an easel to glue on the back as well as a plastic cover so that it won't get dusty and yucky looking. Right now there are changes happening in my life so I probably won't post as often. However, I will seriously try to post at least once a week. I'm also still committed to my fifteen minutes of crafting time every day. It is amazing what can get done in that short of time. Thank you for looking and for leaving comments. Wishing you Happy Frugal Crafting till we meet again. It is windy and the rain is coming down. This would be a good day to snuggle under a quilt remembering the loving hands who made it. I only made a quilt once in my life and I probably will not make another so this quilt card is as close as anyone will get to getting a quilt from me. The quilt image is by Janet Wickell. If you ever get the urge to make an Ohio Star quilt or wall hanging the instructions are here. My trusty Cameo Cameron cut all the triangles and the center square out to make this quilt. He did a great job since it was a print and cut.. 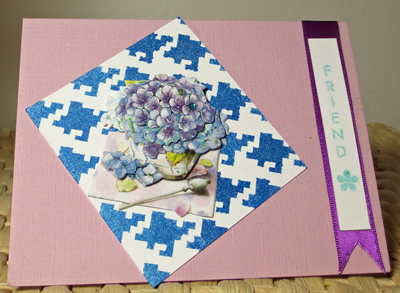 He also cut out the scallop card base which I made from the scallop label file in Studio's library. I seem to use that file a lot. After gluing the square and triangles down I used a gel pen for the faux stitching. I tried on the first quilt block I made to stitch with my sewing machine but it shredded the cardstock. The problem I discovered later was the needle but not wanting to have to make a third quilt block I decided to not chance it. I did use my sewing machine to poke the holes for hand sewing on the sentiment. My demon machine was doing strange things to the stitch width. I am going to take it to have someone look at it and maybe it can be tamed. I also discovered why I was given the blue crochet thread with silver.It kept knotting and the silver thread kept breaking. I did though think I managed pretty decent hand stitching given the circumstances. While working on this card I couldn't help but remember a song "Many Hands" written by my friend Sherry Krebs. The words are about how under the quilt you can feel the loving spirit of the friends that you have blessed. 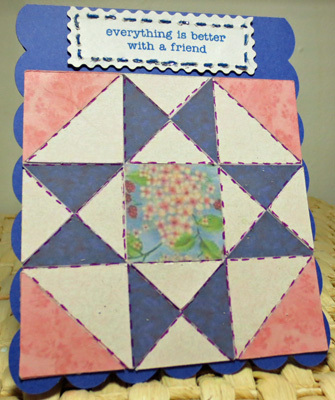 It is also about how we all are quilters as we weave memories,laughter,bright happiness and cheer. You may have noticed that I have not yet shared days 8 and 9. That is because those are going to be a little more involved. Especially day 8 as it will take some math to figure out how to make the card smaller. Day 9 will be fun but a lot of work. I am going to try to get those assignments done and posted before the end of the month. Thank you for stopping by and leaving comments. Do come back. Wishing you Happy Frugal Crafting till we meet again! One of our class assignments was to make a card with a clay magnet embellishment that we stamped on. This is the card I came up with. For the background paper I lightly brushed tinted gesso over a scrap of pattern card stock. When it dried I stamped it in a random direction with my heart stamp. I used part of a Bic magnet that I bought over a decade ago when I was making my own magnets. It is a flat rubberize magnet which is perfect for on a card. The best part of the magnets too are that they really stick. I'm not sure I like the orange I used but I thought since there is orange in the pattern to go with it. Perhaps I should have used part of a lighter orange color and the same with the yellow. Thank you for looking and leaving comments. 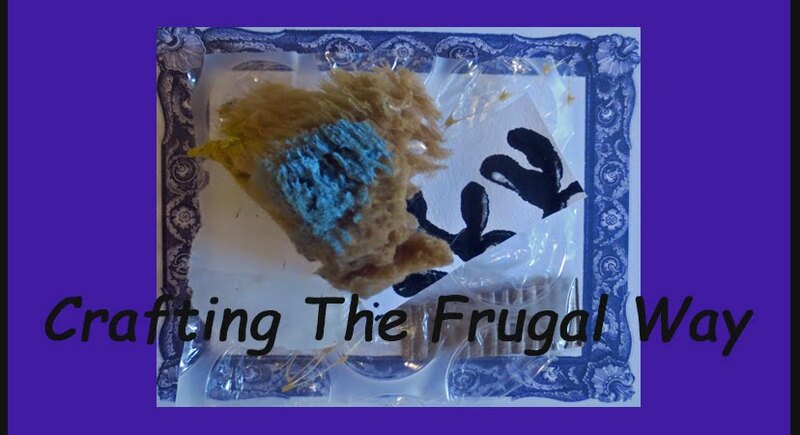 Wishing you Happy Frugal Crafting until we meet again!. The assignment was to use stencils and paints to create a layered background. It was to start with a light color and gradually go darker with colors. Well I don't have stencils so before stamping images,scanning them and turning them into stencils I decided to see how they would work out used together. I used bubble gum pink with a background stamp. 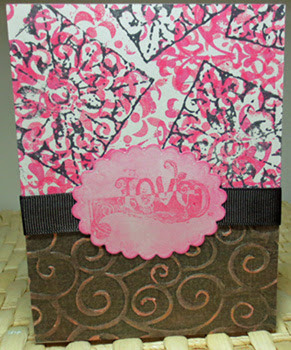 Then with a cube stamp I used party pink ink. With another side of the cube stamp I stamped with black dye ink. I used a black and gray scrap of paper for the embossed panel. I discovered that it was similar to core cardstock so was able to sand it. I then rubbed gold ink over it but it appeared too yellow. The I rubbed red gold ink over. I didn't have black ribbon so I used a Sharpie marker to color it. I used my oval die to cut out the tag Don't tell my friend Beth but I used more of that gray cardstock. LOL!. I rubbed bubble gum pink over it making the edges darker. I used a Fancy Pants Bella stamp for the sentiment. I wanted to stamp with black but I didn't like how it looked using dye ink.I need to buy some black pigment ink. I went ahead and used the Party Pink. This was my first attempt. I didn't have a stencil so I cut one out of contact paper. I left the backing on and discovered it would have been better if I would have taken the backing off and used the sticky side to adhere temporarily to my card stock. When I took the stencil off the gel that had seeped underneath stuck the stencil to the card stock tearing the card stock. I salvaged as much as I could as I did like the result. I had left over colored gesso from playing with another resist technique so I painted the window panel that Cameron(my Cameo) cut out. After it was dried I embossed and sanded to distress it. Alas with this embossing folder there is for some reason a tendency for it to tear in one area where it is embossed. Even taking it out of the folder without sanding it. :-( LOL! Maybe that is why it is retired. The butterflies are stickers which I mounted on card stock and cut around so I could pop dot them. The large one hides the tear in the frame and the small one hides the small tear in the resist panel. I thought this resist panel was too pretty to trash instead of using. I forgot that light colored inks did not work with my stamp. Not wanting to go with black and not having a lot of dark colored inks I went with a purple ink I bought for a $1 which is usually too juicy. 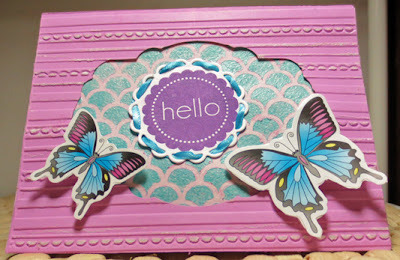 I love how my scalloped die was perfect for using with this stamp. 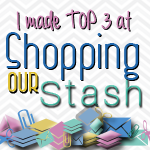 When I saw the narrow ribbon on my ribbon rack I decided to weave it around the die cut shape. I think I'm going to have to buy more super narrow ribbon as I love the result. Luckily there is still two shelves for more ribbon. I had so much fun playing with this technique yesterday and using different media. 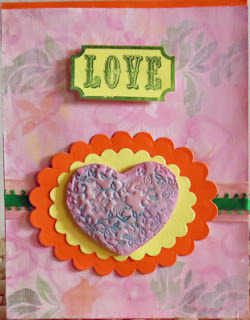 I like the crackle paint the best and will be sharing a card here as soon as I decide what I want to do with it. Another week is here and it is week 2 of the class I'm taking. Cameron is going to be getting a real workout cutting stencils for today's homework. Luckily my nearest dollar store had rolls of clear contact paper. Now when I see a dollar store with it I'll definitely buy it. Thank you for stopping by and do come back. Also thank you for those who leave comments I really appreciate it. Happy April Fools! Wishing you Happy Frugal Crafting till we meet again!